As a child, I was a complete bookworm. So much so, that when I got lost in shops, the first place to look was the book section. There I’d be, whiling the time away stuck into another story blissfully unaware, while the world went on around me. As an adult, this has lessened due to circumstance – I don’t make the time as much as I used to. The vast majority of my reading is digital, through the Kindle app on my phone, and even that means time focused on just that. The big change came with my introduction to audiobooks through Audible. I’ve found that I’m able to multitask, listening to these books in the background and getting on with what I need to do. I’ve found books I probably wouldn’t have picked up the hard copy of, and felt like a friend was talking to me listening to them. In particular, I like my audiobooks non-fiction – I don’t know why, it feels like they’re meant for things factual and conversational. I like them to pique my interest in a topic and pull it out slowly. I’ve found lots that have me inspired to be and do more with my life. 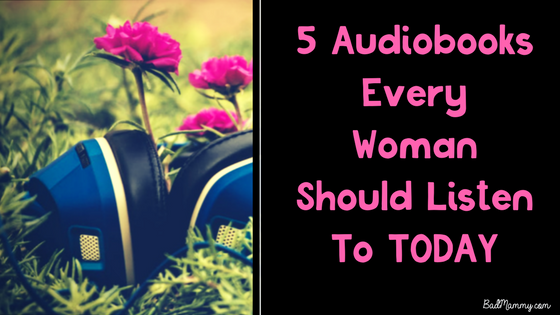 So, here’s a few that I think every woman should listen to – for both that joy feeling, and self development all wrapped into one.